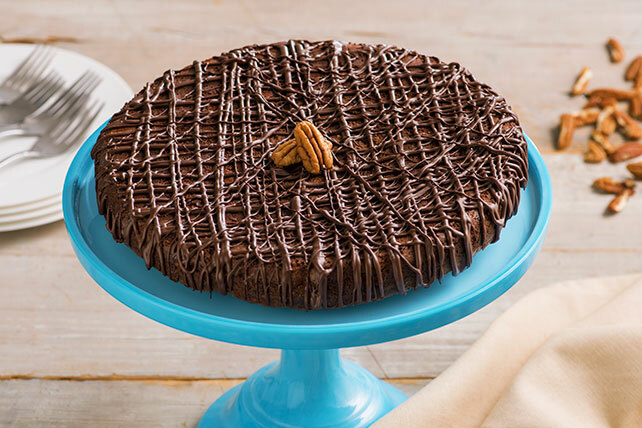 Our BAKER'S ONE BOWL Bittersweet Torte looks like it belongs in a bakery window. But why let the baker take the credit when you can easily make it at home? Spray 9-inch round pan with cooking spray; cover bottom with waxed paper. Microwave 4 oz. chocolate and butter in large microwaveable bowl on HIGH 1-1/2 to 2 min. or until butter is melted, stirring after 1 min. Stir until chocolate is completely melted. Add sugar; mix well. Blend in eggs and vanilla. Add flour and salt; mix well. Stir in nuts. Pour into prepared pan. Bake 40 min. or until toothpick inserted in center comes out with fudgy crumbs. (Do not overbake.) Cool in pan 10 min. Run small knife around side of pan to loosen edge. Invert torte onto wire rack; remove waxed paper. Cool torte completely. Melt remaining chocolate; drizzle over torte. Let stand 15 min. or until glaze is firm. Enjoy a serving of this sweet treat on special occasions.